The day of your wedding whizzes by with butterflies flitting in your stomach and tubes of lipstick brushed against your lips and curling irons heating up your hair. So before the chaos of the day sets in, either at your rehearsal dinner or first thing in the morning, thank your sweet bridesmaids for joining you on your big day with a few thoughtful gifts. 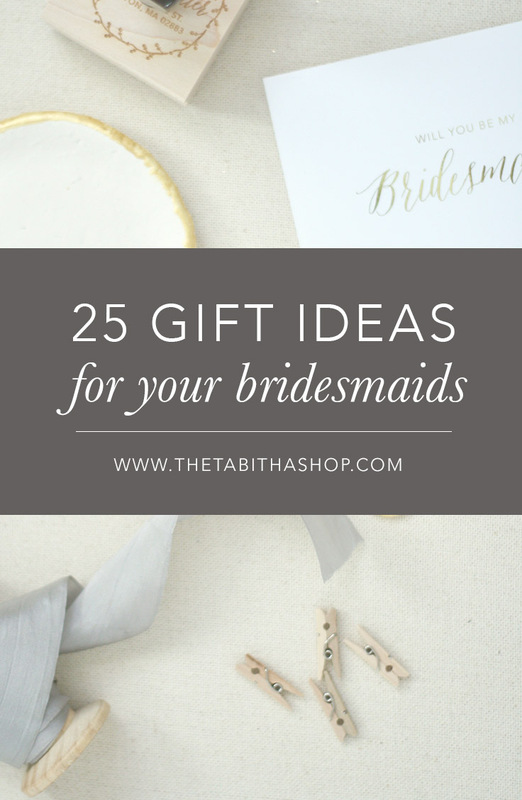 The Internet is an overwhelming mass of things you could buy, so I pulled together this helpful (and if I may say so, gorgeous) list of 25 gift ideas any bridesmaid would be thrilled about. Purchase a few of these, throw them into a gorgeous lettered bag, and you're ready to rock it. Wine tumblers + personalized + rose gold. These are perfect to give your bridesmaids so y'all can sip on mimosas and white wine while you get ready. Plus, your bridesmaids will want to use them again and again! Sure to brighten up any bathroom or closet, these ring dishes are just gorgeous. Personalize them with an initial or just a simple heart! I love how simple and still thoughtful this gift is. These gorgeously lettered bags would be perfect to house all of your gifts! A friend used these for her wedding and they were gorgeous! These shawls come in all colors and they're beautiful! If you're having an outdoor wedding during the winter/early spring or have a friend who gets cold easily (ahem, like yours truly), these are perfect to throw over your shoulders. Ok, I cannot get enough of this candle. I love the smell of old books. Make your book-loving bridesmaid day with this candle. These bath salts are advertised as wedding favors (which would be beautiful and fun), but I think they would be perfect to add on to your bridesmaid gifts. They look beautiful and I'm sure they smell just as gorgeous. Minimal necklaces forever! These pretties can be personalized to say whatever you want to say to your besties, too! For the home-sick or crazy patriotic friend, this necklace is gorgeous and meaningful! Leather clutches get me every time. They're classy and versatile. And you can even monogram it to make it even more personalized. This air plant is adorable! Many of these come in cute little boxes, too, to say an extra big "thank you." This jewelry box would be a gorgeous gift for your maid of honor or mom! We all have that friend who can't get enough of traveling. This luggage tag would be a sweet way to encourage her to keep doing it! If a ring dish isn't exciting enough for you, this ring cone should do it! They're fun and practical, too. What a GORGEOUS gift! This Bible is hand painted and personalized. It's one your bridesmaids will want to keep and read forever. So fresh and so clean. This soap gift set is perfect to help your bridesmaids relax after a super fun wedding weekend. I used to own a necklace from Poppy & Fern (until my Roomba ate it..), and it was one of my all-time favorites. The frame is vintage and the embroidery is perfect. The leather and black fabric combo on this leather bag is perfect. And, it's rather affordable, so you can get one of all your 'maids. If you've got a boho, casual theme going for your wedding, these earrings would look stunning on all of your bridesmaids. Otherwise, they're just beautiful for every day wear! For the bridesmaid who cooks all the time, these bowls will help make her kitchen all the more gorgeous. They're handmade, too, so praise hands for supporting artists. For the 'maid who loves to travel, gift her this gorgeous watch to remind her of all the adventures she's had! You can also change the band to any color you want. Again with the minimal jewelry because it'll never go out of style. These rings can be personalized, too! I love how unique this map is! If you've got that friend who would rather be camping outside right now, this is perfect to help her track all her adventures. Every bridal party should have a cat lover in it. ;) This cat print will help her celebrate her feline affections. Pair this cutting board with those white bowls from above and you have a GORGEOUS kitchen all ready to go. This bag would be perfect to stuff a few gifts in to give to your bridesmaids. And, it's versatile to later hold makeup or knick knacks!